*This is a paid collaboration with Thermapen. 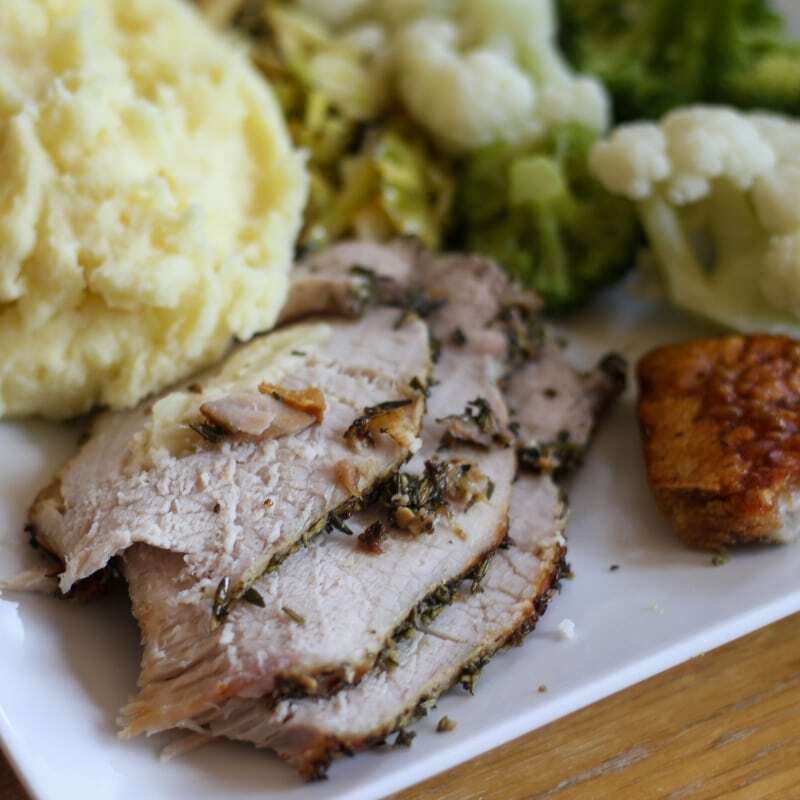 We have teamed up with Thermapen to create this delicious recipe for Herb Encrusted Pork Loin stuffed with Pecorino and Garlic. This dish is perfect for a family Sunday roast, but it could also make a special dish for any dinner party. 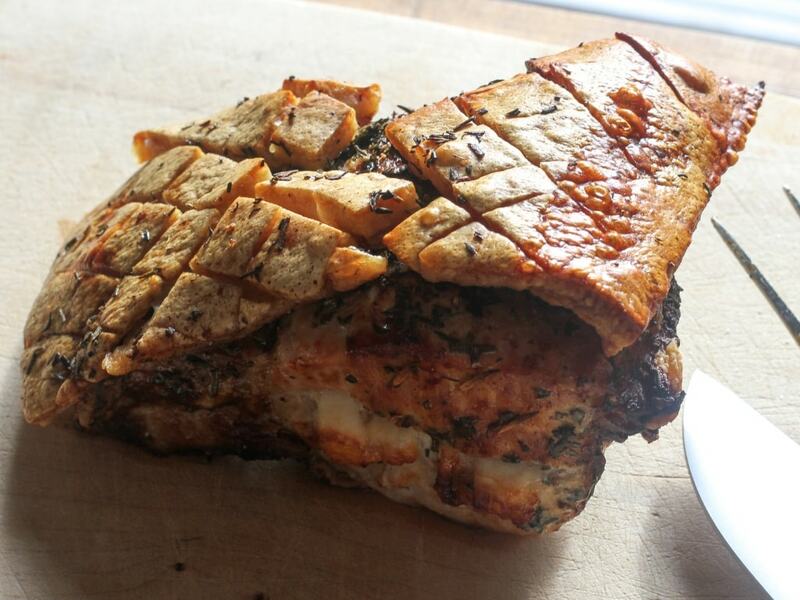 The pecorino and garlic give the meat a unique twist and superb flavour, and our method will guarantee the perfect crackling to accompany your meal. 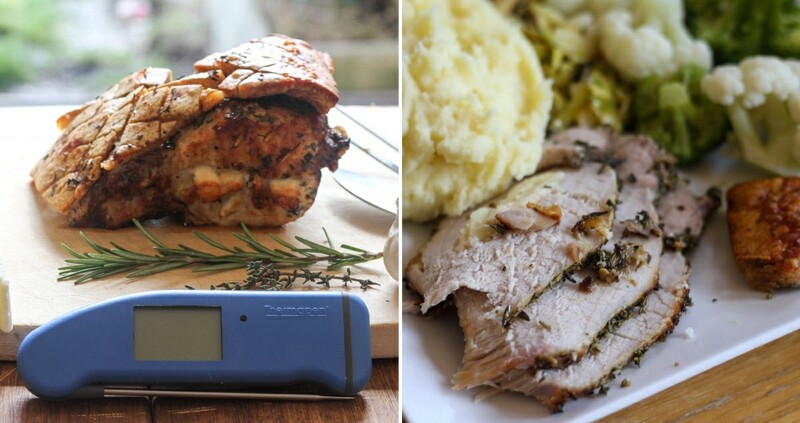 You can find out how Thermapen can help you create perfectly cooked meals below. A Thermapen is not essential to make the recipe. 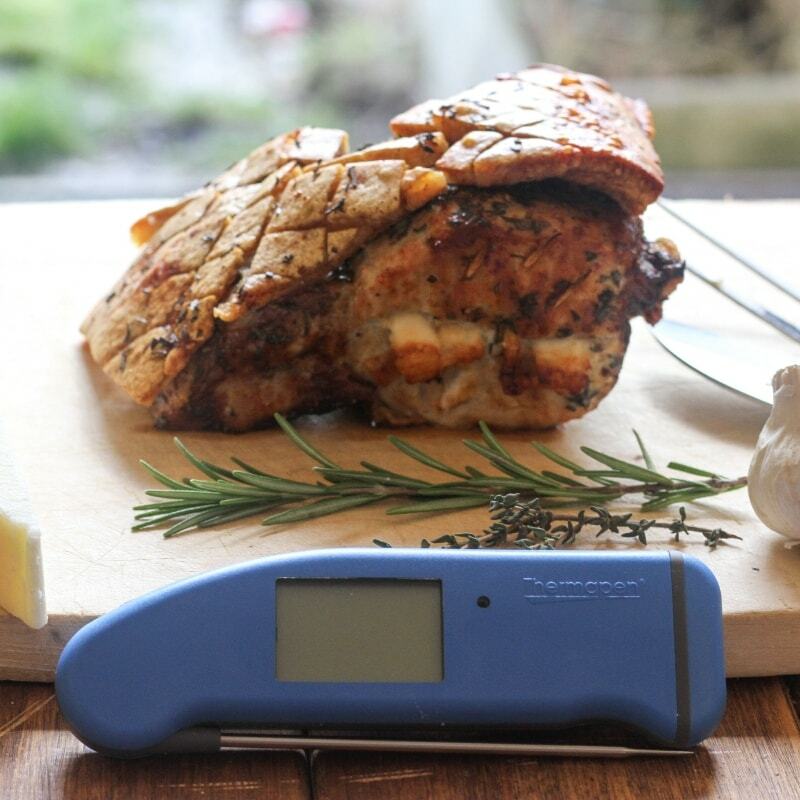 British-made Thermapen thermometers are fast, accurate and used by chefs and BBQ enthusiasts worldwide. 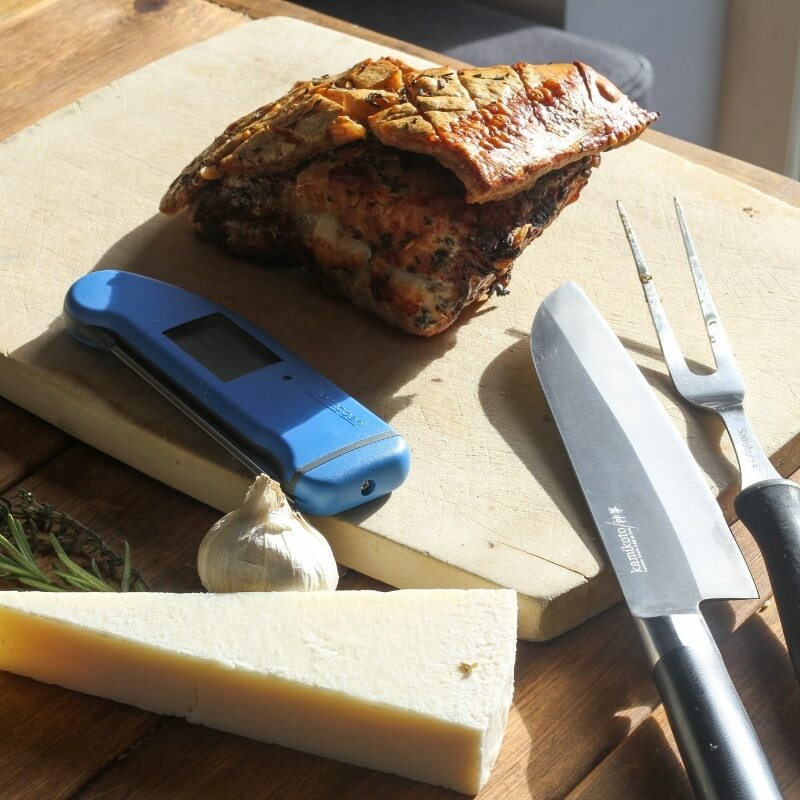 The Thermapen Professional incorporates a reduced tip, stainless steel probe that allows the true temperature of food to be measured accurately in just 3 seconds. In addition, it conveniently folds back through 180° into the side of the instrument when not in use. The Thermapen also has a motion-sensing sleep mode, which automatically turns the Thermapen Professional on/off when set/down or picked up. We loved how quick and easy it was to use and how it did everything automatically. Above all, when cooking for a young family, it is essential that foods, and particularly meats, are cooked thoroughly and have reached a safe temperature. 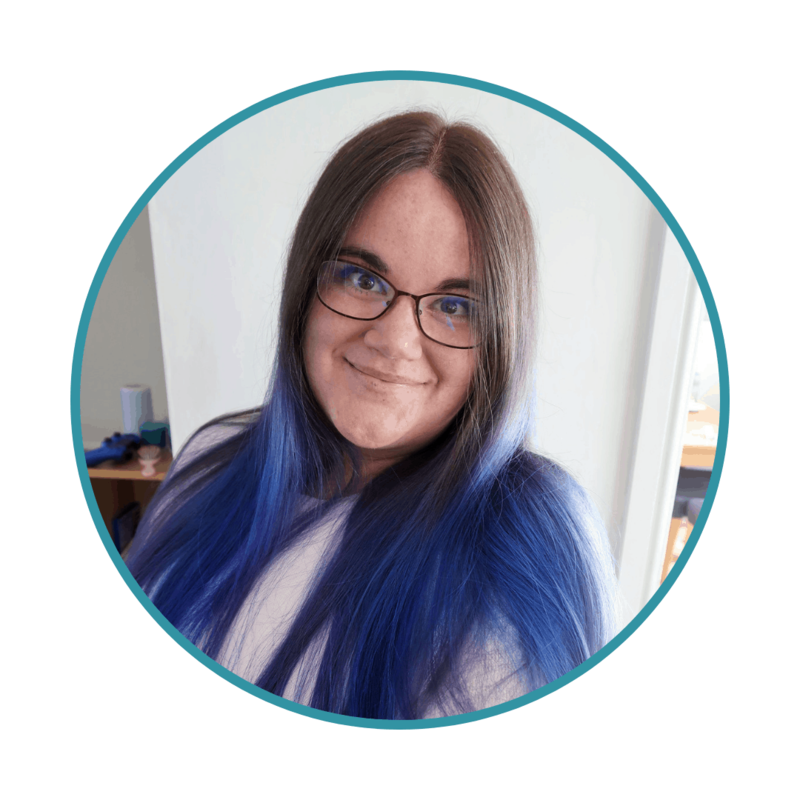 Moreover, as a family who loves really good food, and with a father who loves to cook, we want to make sure the meat is not overcooked either. Thermapen is the perfect solution. The Thermapen is really easy to use and super fast – meaning it does not add unecessary or complicated steps to the cooking process. It takes just a moment to be sure your meal has reached a safe temperature. Optional: You may wish to brine your pork loin first. We used 1/10 salt water for 1 hour and then rinsed throughly. Take off the crackling layer and remove any excess fat from the bottom layer. Next, score the top, lattice style, and rub fine salt into it. Make an incision in the pork loin, from one side almost all the way through, lengthways, with a slight downward slope to it. It should be 2 inches or so wide. Slide in slivers of pecorino and thinly sliced garlic. Secure with a skewer or a few cocktail sticks. Make a herby mix of crushed fennel seed, dried rosemary and dried sage. Roughly equal parts, about 3 tsps of each. Pat the pork dry and coat it on all sides with about half the herbs, and season with salt and pepper. Prepare a roasting tin with a rack that holds the pork off the bottom, and preheat an oven to 220. Meanwhile heat a few tbsps of a high smoking heat oil (rapeseed perhaps) in a pan until very hot. Quickly seal all sides of the pork in the pan, just a couple of minutes each side. When the pork is sealed, coat the top with the remaining herbs and lay the crackling layer back on top before it goes in the oven. Next, transfer to the roasting tin for 30 mins per 500g plus 30 mins, turning the heat down to 180 after the first 20 mins. Finally, to ensure that the meat is a safe temperature, without overcooking, insert the Thermapen into the centre. 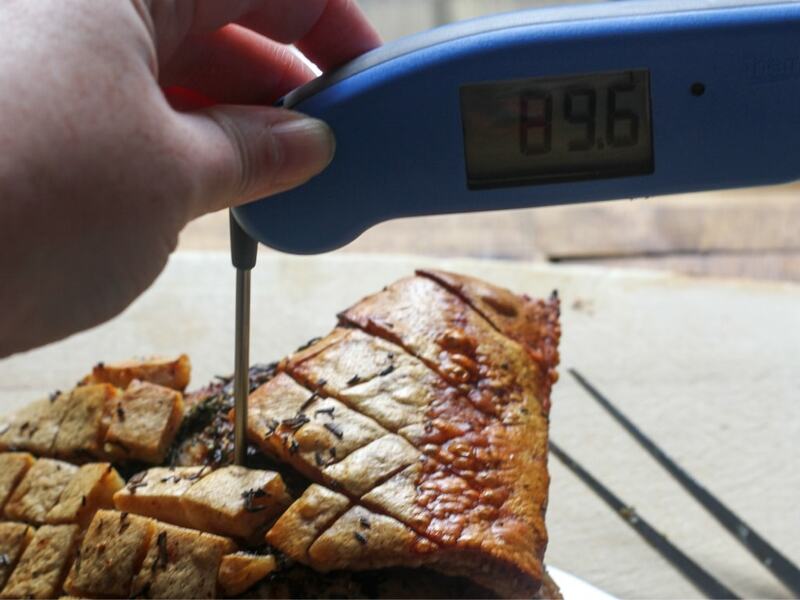 You can use the Thermapen Temperature Guide to find the perfect temperature for your meat. However, as this was is a family meal, we ensured the meat was well-done and had reached at least 71 degrees. This is the suggested temperature for pork. Once you are happy the meat is cooked, you may carve and serve. This is a paid collaboration with Thermapen. For more information, please see our Disclosure Policy.